Talk about making a name for yourself quickly. Earlier this week, Knicks guard Jeremy Lin was found on the cover of Sports Illustrated for the second week in a row, an honor last received by the Mavericks' Dirk Nowitzki during last June's NBA Finals. Just how special is Lin's treatment? 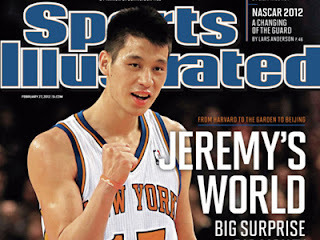 Well, he is the first athlete on a New York sports team to land on the magazine's cover two weeks in a row since it started in 1954. Eli Manning, Joe Namath, Patrick Ewing- guess you didn't make the cut. Keep the LIN-sanity rolling!